Paradorn Srichapan is my favourite tennis player and Asia's number one player. Although he's form had taken a drip recently. He is still one of the best players to watch in terms of quickness and flexibility. Paradorn made it to the Mercedes Benz Play of the week section on the ATP tennis tour showing his quickness, agility and most importantly flexibility in this two play of the week footage taken from the ATP Tennis Play of the week archives. Roger Federer using a "Flexpoint"? When you you talk about how stiff a tennis racquet is and how the vibration of a mis-hit shot and travels up to your arm and elbow one wonders what the heck is this all about? As you guys might have already known from my previous posts, I have this case of severe tennis elbow which has hindered me from playing seriously since last August. I happened to stumble on this slow motion video of Roger Federer. This is one of the best slow motion videos I have seen so far. Look closely at Federer's racquet straight after he hits the ball, you'll notice his entire racquet "flexing" and "rippling" as it it was made of jello. It kind of reminded me of the Head Flexpoint Technology. I guess all tennis racquets flexes to a certain degree. Depending on how stiff it is, there will be definately some feedback from an off center shot. Look at Roger's shots, they are all in the "sweet spot" but look at the amount of vibration and flex it already has. 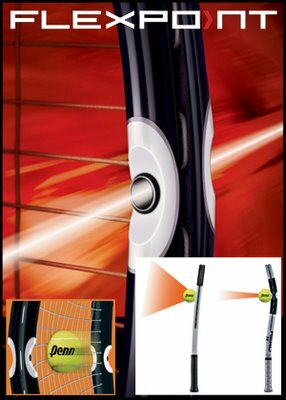 One can imagine the greater vibration caused to your arm and elbow with an off center shot. A combination of a stiff racquet and a high tension is a classic receipe for that tennis elbow problem of yours. I hope this video will be able to highlight how "vibration" travels up to your racquet and to your arm. My advice, try to get a more forgiving racquet with more flex. Something which is less than 60 in terms of stiffness. I am now currently using the Head Flexpoint Radical OS. It stiffness is around 58, and I have strung it pretty low at around 56 pounds. My elbow is starting to feel slightly better but it's still not at 100% yet. I would like to Thank all my readers worldwide who have been emailing me on how to cure my tennis elbow as well as giving me advice on this problem. Keep those suggestions coming.